Mochizuki, T., Oura, H., Sato, T., Nishimori, T., Tsubakimoto, M., Nakahara, J., Yamauchi, Y., Henrik, J., Matsumoto, K., Watanabe, S., Miyatani, T. (2009). 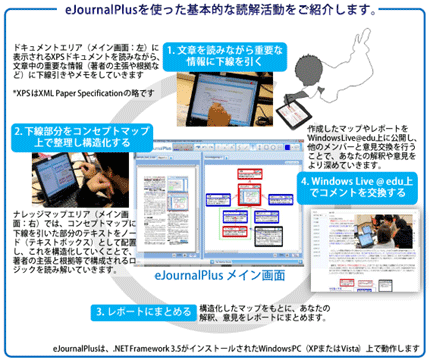 eJournalPlus: Development of a Collaborative Learning System for Constructive and Critical Reading Skills. In Dimitracopoulou A., O’Malley, C., Suthers D., Reimann P. (Eds.) (2009) Computer Supported Collaborative Learning Practices – CSCL2009 Community Events Proceedings, (pp.100-102), ISLS. (Poster presented on June 11th at Rhodes, Greece).